Dwarf apple trees are a great way to grow apples in a small space. However, size is not the only advantage they offer gardeners. 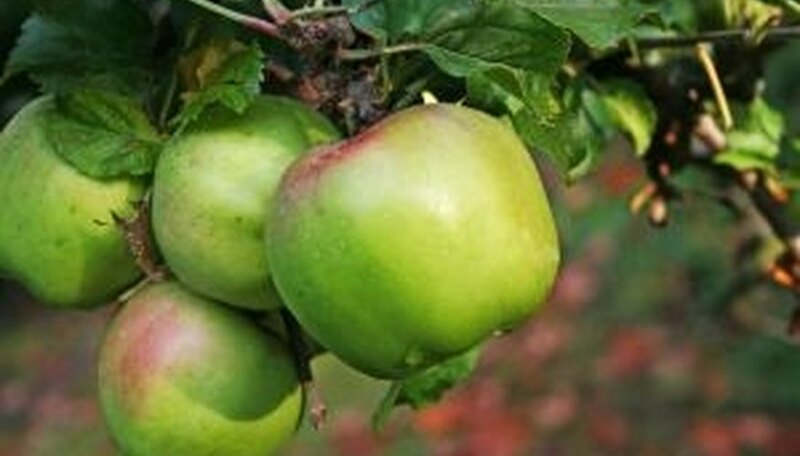 Dwarf apple trees are also easier to prune, spray and harvest. They also bear fruit easier--in just 3 or 4 years as opposed to 7 or 8 years for standard apple trees. Dwarf apple trees are not grown from seeds but are created by grafting a regular apple tree onto the rootstock of a dwarf tree, which is why all dwarf trees produce standard size apples. The grafted tree is then grown in a nursery for at least a year until it is large enough to be sold. Decide if you want a dwarf tree or a semi-dwarf. Semi-dwarf trees grow about 15 to 20 feet tall but are more vigorous and hardier than dwarf trees. They will produce about five bushels of apple a year. Dwarf trees will grow about 10 or 12 feet tall and produce about two bushels of apples each year. However, they have weaker roots and need more care. Purchase trees from a reputable garden dealer or nursery. If possible, purchase trees that are dormant. Look for one year-old trees that are about 4 to 6 feet high and at least 5/8 inches in diameter. Buy at least two types of apple tree because most are considered "self-unfruitful." This means that they are unable to pollinate themselves and require pollen from a different variety to produce apples. Even varieties that are self-pollinating, such as Golden Delicious, Jonathan and Yellow Transplant, will do better when self-pollinated. Dig several holes for your trees. Make sure they are far enough apart. Full dwarf apple trees should be 8 feet apart with rows at least 12 feet apart. Semi-dwarf trees should be 10 to 14 feet apart with 16 to 22 feet between rows. Holes will need to be wider than they are deep to allow the roots to spread out. Plant trees in an area of full sun with a soil pH of approximately 6.5. Trees should be planted in the spring while they are still dormant. The graft union (a diagonal scar on the trunk of the tree) should be 1 to 2 inches above the soil surface. Do not fertilizer the planting hole. Stake trees to provide them with support. This is especially important if the trees were grafted onto M.9 and M.26 rootstock. Prune your tree regularly. Remove any branches that grow below the graft union. Wait. In about 3 or 4 years you should have all of the apples you desire. Several varieties of apple trees will not serve as pollinators including Rhode Island Greening, Gravenstein, Mutsu, Roxbury Russet, Jonagold, Spigold, and Baldwin. All apple trees need at least one month of cold weather to grow.